For about as long as people have been selling products, they’ve been thinking about where to find customers and how to reach them. The classic sales and marketing funnels date back to the late 1800s and provide a simple metaphor to think about the path a customer takes on the way to purchase. The sales funnel in the figure is a common example of how a funnel can map the journey a person takes from prospect to customer. It can also be used as a starting point in building a journey map. Funnels show that people move from becoming aware of a product or company to becoming interested to eventually making a purchase. They provide some clear stages for understanding the customer journey and targeting marketing, advertising, and sales efforts accordingly. For example, it doesn’t make much sense to talk about pricing when people don’t want or haven’t heard of your product. Just about every marketing organization has or should have a funnel. 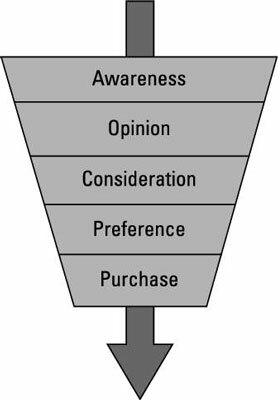 In fact, the funnel concept of AIDA (Awareness, Interest, Desire, and Action) was at the center of a famous scene with Alec Baldwin in the movie Glengarry Glenn Ross. Narrow down on a choice. It’s a theme you’ll use with the customer journey map you create as well. The table compares different types of marketing funnels to illustrate their similarities. The marketing funnel is a linear process as the metaphor suggests. People start at the large end of the funnel and then make their way through the stages. The narrowing of the funnel conveys the smaller percentage of people who make their way through. Linearity in mapping the customer journey can be limiting because it assumes every customer starts in the same spot, proceeds through the same steps, and finishes at the same end point. You can overcome this challenge by incorporating loops back through earlier stages. 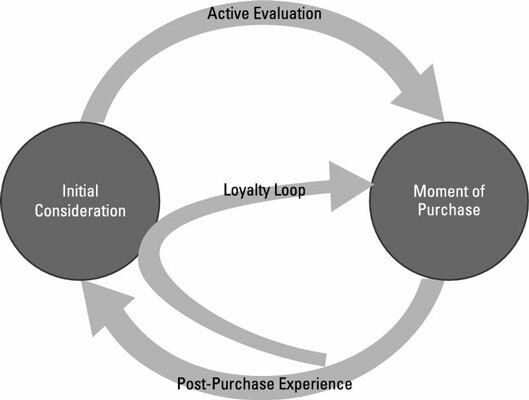 Another adaptation to the model, like one from McKinsey shown, emphasizes that customers’ loyalty is less of an end point, but the beginning of a loop where the customer goes back to the consideration phase before the next purchase point. This is especially the case with products and services that are purchased regularly, like rental cars, coffee, computers, or hotel reservations. The funnel metaphor is a bit odd. After all, as any kindergartner will tell you, everything that goes in one end of the funnel comes out the other. That would be like every prospect turning into a purchaser. If that were true, all you’d need to do is make and advertise a product and you’d be the next Bill Gates! So unless you’re working for the IRS or have some sort of mandatory product, customers will drop out of the funnel at some stage. A better metaphor might be the marketing filter or marketing sieve. Despite some recent criticism of the linearity of the marketing funnel (and the flaw with the metaphor), the marketing funnel will probably continue to endure. One reason is that modifications to the model are still generally linear, as you see with the customer journey map.